A Picture of the Future? I’m going to show you a picture. Tell me what you see in the picture’s future. Come on. Ignore the alfalfa. Ignore the chicken tractors. What should be here? What would you do with this space? I’m asking you to be creative. I have an acre that makes several tons of feed for ruminants and chickens. Is that the best I can do? What else could I do with the space? Remember this mild disturbance from mid-March? Recovery is slower in the absence of rain…but it does recover. 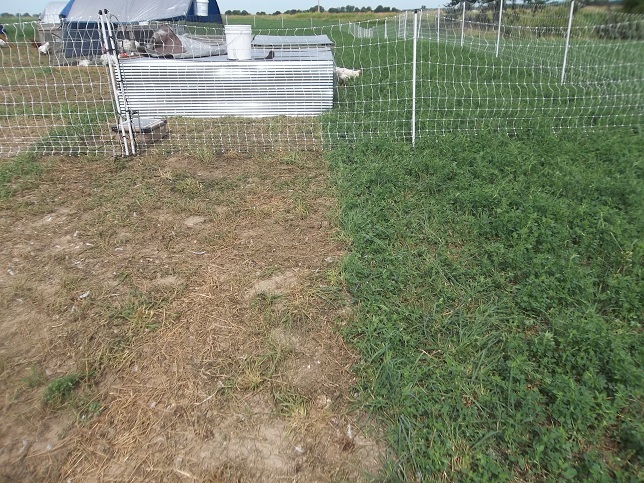 I’m have raised 4500 pounds of chicken on this field and two cuttings of alfalfa…and it’s not even July yet. But then what? I haul goat and cow manure out of the shed to spread it out on the field again? I compost the chicken guts and bring them back out to the field? Isn’t there something better I could be doing? I ask this because I’m reading The Blueberry Years. Also I’m making an intensive study of permaculture right now. What if I planted 1,000 berry plants? What if? What if I planted them on contour to preserve water? What if I planted an orchard? What if I planted a food forest? What if I just sculpted the landscape to retain water and grazed it with beef? Where would I raise chickens? Would I raise chickens? Possibility overload! 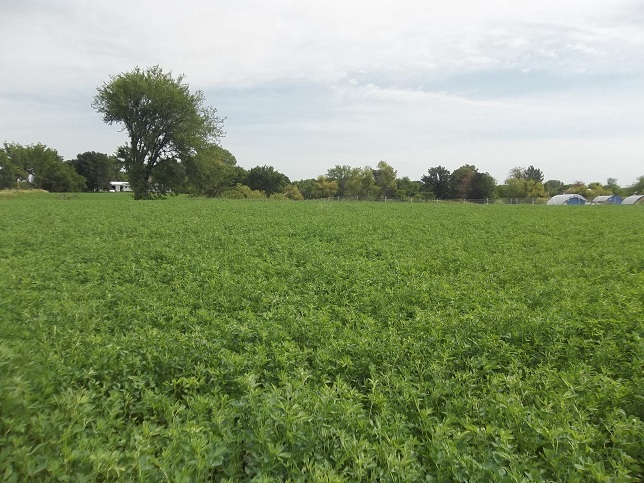 I look at the alfalfa field and I see any number of possibilities…maybe even a series of greenhouses. What do you see? What could be there? 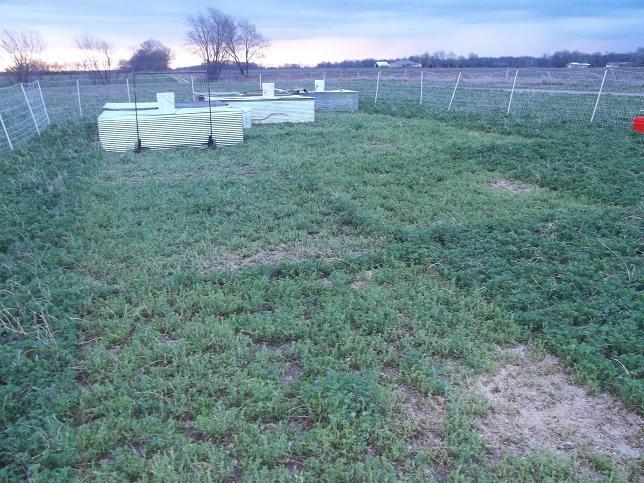 This entry was posted in Pasture Management and tagged Blueberries, Dreaming, Future Plans. Bookmark the permalink. Graze ruminants – cattle or sheep on it? I mean, it’s already doing quite a bit if it’s allowed you to raise more than 2 tons of chicken plus two cuts of alfalfa. If you did blueberries, you could space the rows wide enough to take chicken tractors between (a guy does that here). 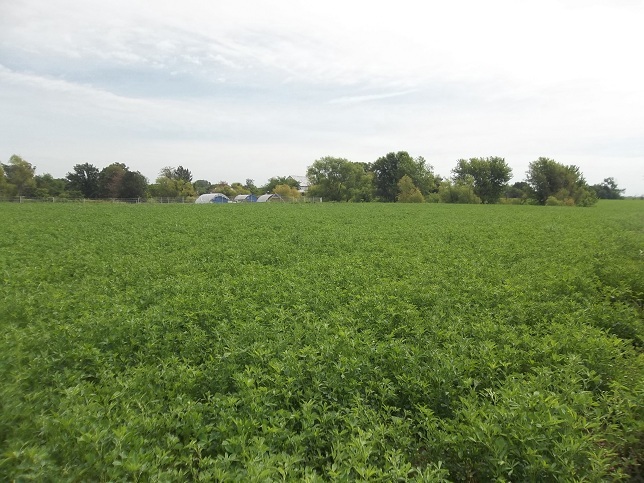 You could combine grazing with some of your other ideas – the food forest is an awesome concept, you could do that in one area, fence it out and still graze and cut hay. The food forest would allow you to plant some blueberries. Whether you want to go to the level the Blueberry Years guy did – I don’t know – I dipped into that book a couple of years ago, and got the impression the berries caused him a lot of stress and money. I’ve been thinking similar thoughts. We have a bunch of acres of timber. We could harvest that or we could rent out hunting – neither is pleasing to me. BUT the real question is what can we do with it to help pay the taxes, remain environmentally responsible and personally satisfied?